The following presentation was made to the Southern Ontario Municipal Stormwater Discussion Group on September 27, 2018. 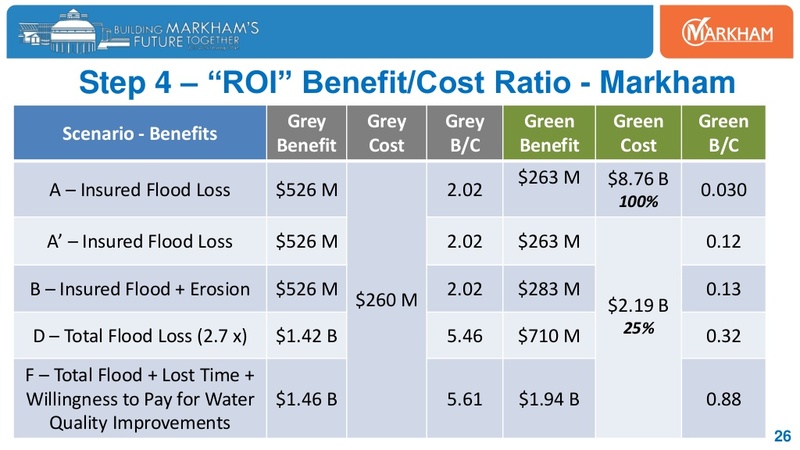 It describes benefit-cost analysis to show the return on investment (ROI) of infrastructure improvements to reduce flood damages (insured and total), and to achieve other benefits including erosion mitigation and water quality improvements. Earlier benefit cost analyses for projects ranging from the Winnipeg floodway to the Stratford, Ontario storm system master plan are shown. 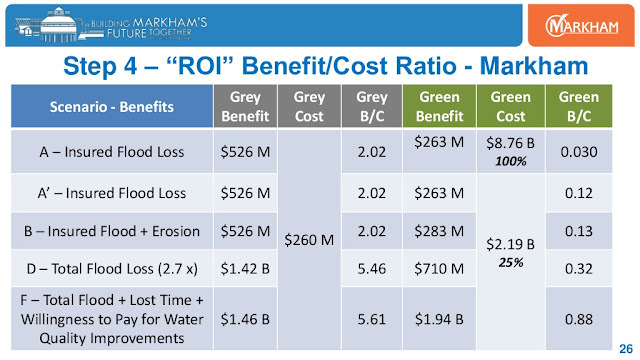 The benefit-cost ratio of an Ontario flood control study is shown including a comparison of grey and green infrastructure cost effectiveness - analysis shows the grey infrastructure solution can meet the current Disaster Mitigation Adaptation Fund (DMAF) benefit/cost threshold of 2:1 required to be eligible for federal funding. In addition, city-wide analysis of grey infrastructure storm and sanitary system upgrades and green infrastructure / low impact development infrastructure strategies is summarized. 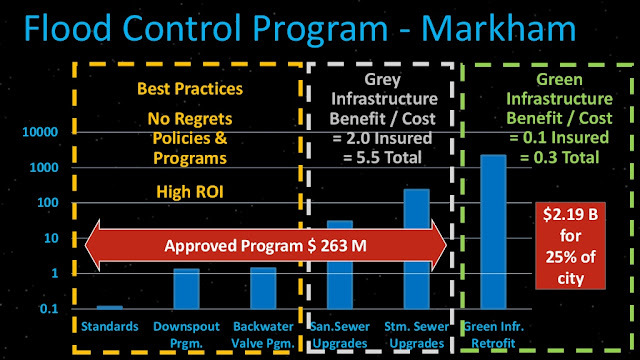 Results show that the grey infrastructure solution can meet the DMAF benefit/cost threshold of 2:1 but that the benefit/cost of green infrastructure is substantially below it considering flood reduction benefits. When other benefits are considered, and targeted implementation of green infrastructure is considered (e.g., representing 25% of the urban area with limited overland drainage design standards) and considering additional benefits including a substantial 'willingness to pay' estimate for water quality improvements, costs continue to exceed benefits. The insurance industry and some affiliated research groups have suggested that natural infrastructure or green infrastructure should be considered to improve climate resilience and reduce flood damages - this analysis would suggest that approach is misguided and could misdirect scare resources to ineffective strategies. In addition, the impacts of green infrastructure that infiltrate runoff into the ground, stressing wastewater systems and increasing basement flooding have not been considered in the analysis - if considered, these wastewater system flood impacts, as well as pumping and treatments costs, and potentially the cost of increased CSO's and their water quality impairment, would have to be estimated to reduce the net benefits achieved by managing overland flooding. Grey and green infrastructure benefits and costs. Selected scenarios are shown.